Introducing the all-new Kenworth K270 class 6 and K370 class 7, two of the most reliable, efficient and productive medium duty trucks ever to hit the boulevards and back alleys of urban North America. Add up the advantages — payload, productivity, reliability and uptime. Then consider one more thing: resale value. History proves that a used Kenworth is a better value to someone else than just about any other medium duty truck you can name. Kenworth K270 and K370. Your uptown solution to doing business downtown. If you’re looking for ways to work smarter – and more profitably – look no further. More Payload: The T800, with its 48.5-inch set-back front axle, enables you to transfer more of the vehicle’s weight to the front end – taking full advantage of its rated capacity. Any weight you can legally shift to the front axle, you can profitably add to payload – each and every truckload. More Agility: The T800 incorporates advanced steering geometry that produces maximum wheel cut and a tight turning circle – even with flotation-type tires and front drive axle configurations. That advantage, plus a dramatically sloped hood and strategically placed, generously sized windows can increase driver confidence in tight situations. More Control: Kenworth applies sophisticated ergonomic principles and state-of-the-art technologies to create trucks that are easier and safer to drive. Multi- function steering wheel, clutchless automated and automatic transmissions, multiplexed instrumentation and wireless communication systems all contribute to less fatiguing, more productive operation. In a world that tends to relax standards in pursuit of something new, the T800 proves that traditional, time- proven ways have their contemporary application. From day one, Kenworth has engineered strong, lightweight trucks you can count on. Trucks with an unmatched ability to stay together, do the job, cost less to maintain and pay back their investments. 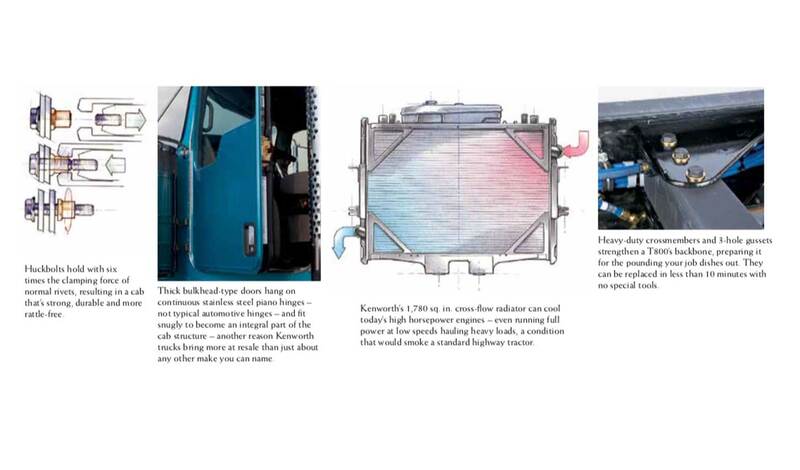 Just slam the door on a 10-year-old Kenworth mixer to see what we mean. Chances are it feels as solid as the day the truck left the factory. Legendary for its longevity and integrity, Kenworth’s conventional cab combines aluminum and fiberglass in a Huck Bolted assembly that’s practically corrosion-proof and rattle-free. Then there are all the little things you might not notice that help keep big things from going wrong. Wiring and plumbing bundled together and mounted high in the frame, safe from chafing, road salts or washing acids. Rubber-bushed shackle pins and bushings to extend suspension life and improve steering. Constant torque hose clamps. Radiator tie rods mounted to frame – not the cab – for longer radiator life. And so much more. It’s this kind of attention to detail that keeps you moving ahead. Day in, day out. Somewhere between shipping and receiving there’s a whole lot of time in a truck. Hope it’s a Kenworth. 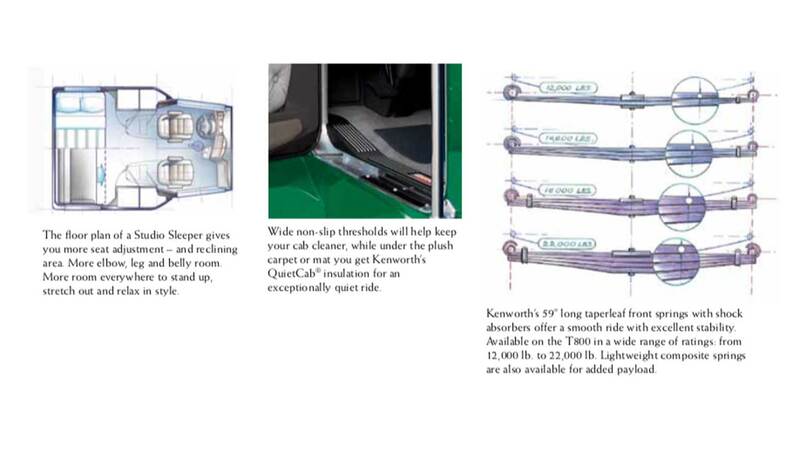 Whether you choose a workhorse-rugged, yet way-above standard Splendor interior or the custom look of a Diamond upholstery package, the inside of a Kenworth has been designed to help those behind the wheel operate at their absolute best. Perform at peak efficiency. And rest in an environment that brings them closer to home. Tour a Kenworth Studio Sleeper, or one of our AeroCab sleepers. Note the consummate balance between business and pleasure. The thoughtful, convenient and productive layout. The creative and elegant interior appointments. 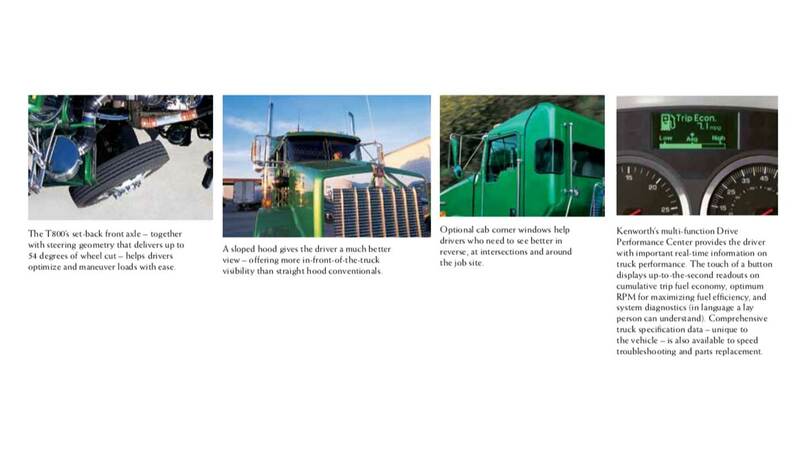 All handcrafted to the same exacting standard we use to build the rest of your Kenworth T800. Then imagine the pride you’d feel knowing you’ve been given the keys to The World’s Best truck. That sense of pride is one of the reasons Kenworth trucks last longer, work harder and bring more at trade-in. And one of the reasons Kenworth operators keep their best drivers. As a custom truck builder, Kenworth offers more job-specific and factory-installed options than any other manufacturer. you can depend on – right from the start. For hauling maximum legal loads without sacrificing strength and durability, you can select from a long list of weight-saving components and options including aluminum hubs, lightweight drums, aluminum clutch housing, aluminum bumper, lightweight charging/starting systems, composite leaf springs and more. 7. Kenworth’s extended day cab offers more head, leg and belly room than a standard T800 day cab, plus extra storage space and reclinable seating – all with just a slight increase in tare weight. 8. A DEF tank under the cab allows the T800 to be spec’d so it will have a completely clear back of cab for a cleaner and easier body installation. 9. A heavy duty cast center tow hook provides a robust attachment point for severe service applications. 10. 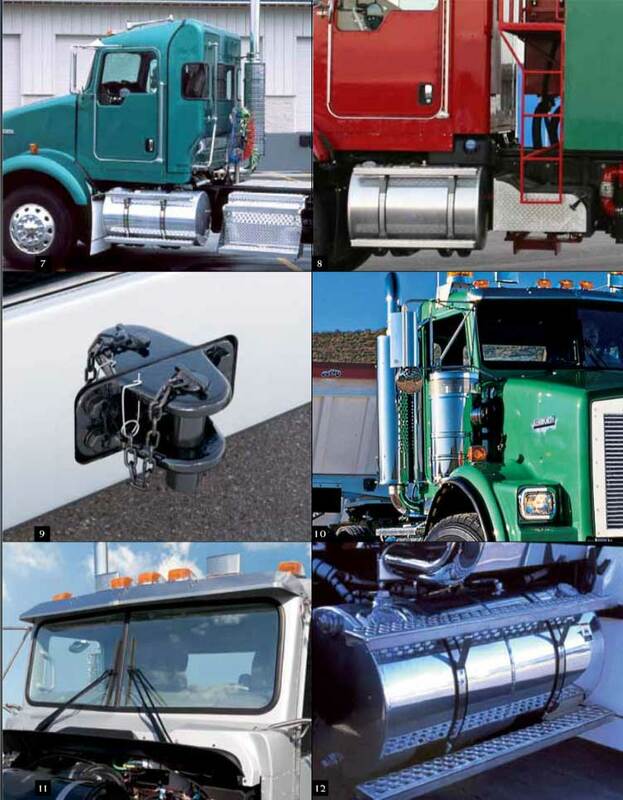 Kenworth offers cowl-mounted stainless steel air cleaners from Donaldson. 11. A new cowl design provides greater specification flexibility – offering flat and curved glass windshields with Extended Day Cab and AeroCab sleeper options. 12. Kenworth-built hydraulic tanks match Kenworth-built fuel tanks for exceptional performance, durability and style. When frame space or weight requirements don’t allow a separate tank, optional split fuel/hydraulic tanks are available (as shown). When the unexpected happens, rely on Kenworth PremierCare® to get you back on the road as fast as possible. Peace of mind is just a phone call away. Take control of your fleet maintenance right from your desktop. Discover how PACCAR Parts Fleet Services gives you greater flexibility. Work smarter with Connect, your online fleet maintenance and inventory management solution. Connect gives you accurate, up- to-date information to help with decisions about maintenance, operations and DOT compliance. Use Connect to meet the demands of your growing business.